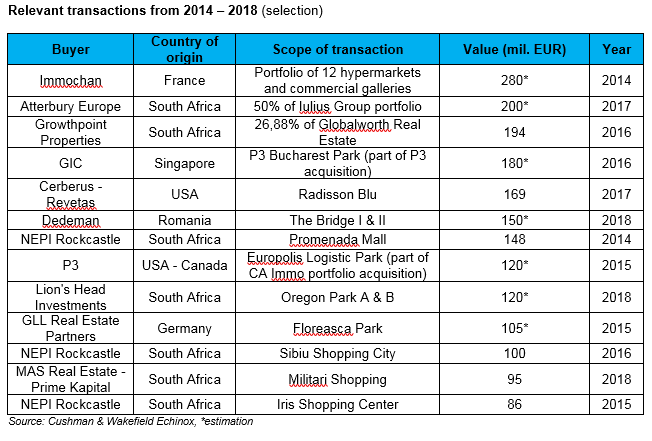 Bucharest, December 2018: Deals of over 4 billion euros have been signed during the last five years on the Romanian real estate market, with the most active buyers being investors from South Africa, with a market share of 28%, followed by Greek investors (14%), French (10%) and Romanians (7%), according to an analysis by Cushman & Wakefield Echinox. In the analyzed range, the local market attracted investors from over 15 countries from four continents, the buyers’ focus being concentrated mainly on properties in Bucharest, with a share of 69% of the total investment. Transactions were also made in Timisoara, Brasov, Cluj-Napoca, Sibiu, Iasi, Craiova or Pitesti, with the market shares pertaining to each of those cities varying between 2% and 5%. The office segment is the preferred asset class, accounting for 39% of the volume traded, followed closely by retail, with a 34% share. The industrial sector generated transactions of almost 700 million euros, with a share of 18%, while the hotel market generated around 250 million euros (6%). Cushman & Wakefield Echinox is a top real estate consultancy firm on the local market, working in all the real estate market segments. The Capital Markets department of the company was involved in real estate transactions in Romania in excess of 300 million euros in 2017 and currently manages exclusive and co-exclusive mandates to sell properties with a market value of more than 350 million euros. Cushman & Wakefield Echinox is the exclusive affiliate of Cushman & Wakefield in Romania, owned and operated independently. The team of over 60 professionals and collaborators offers a full range of services to investors, developers, owners and tenants across all segments of the real estate market, including the residential market. For more information, visit our website www.cwechinox.com . Cushman & Wakefield is a leading global real estate services company with 45,000 employees in more than 70 countries, helping owners, occupiers and investors to optimize the value of their real estate. Cushman & Wakefield is among the largest commercial real estate services firms with revenue of $6 billion across core services of agency leasing, asset services, capital markets, facility services (C&W Services), global occupier services, investment & asset management (DTZ Investors), project & development services, tenant representation, and valuation & advisory. To learn more, visit www.cushmanwakefield.com.